Broadview Oval in Prospect is “shovel-ready” for a $15 million revamp into the state’s foremost multi-sports centre and South Australia’s number two tennis venue. The masterplan for transforming the Broadview Sports and Recreation precinct comes hot on the heels of plans to turn Prospect Oval into the state’s number two football ground with the same field dimensions as Adelaide Oval. 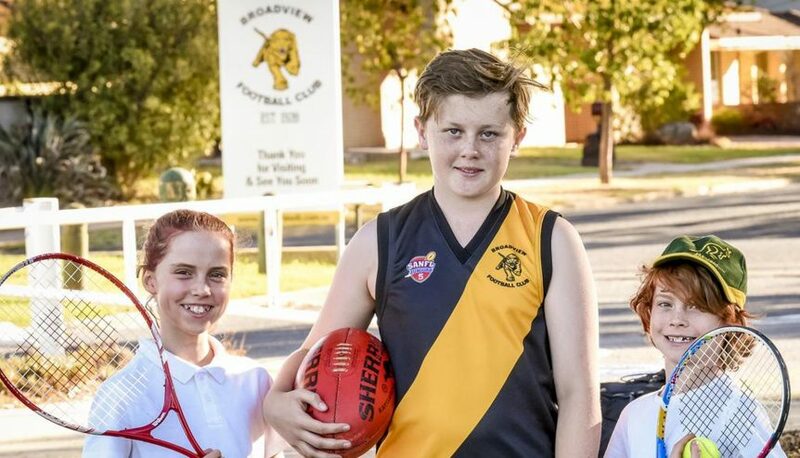 The existing football, cricket, tennis, lawn bowls, running and BMX clubs that already use Broadview were fully on board with plans to upgrade the venue and its facilities, said Prospect Mayor David O’Loughlin. His council had earmarked $5m towards the project. “We have a masterplan, we know what things will cost, all the clubs know what needs to happen — so all that is needed to make it fly is the extra $10m,” Mr O’Loughlin said. “It is the easiest shovel-ready option when it comes to federal government funding in the city. Broadview Tigers under 16 female players (clockwise from bottom) Julia Clark, Olivia Irving, Caitlyn Davil (captain), Natasha Richards (Vice Captain), Sophie Sullivan, Luci Johinki and Charlie Crawford. Picture: Tom Huntley. Mr O’Loughlin said there was a “dire need” to replace or move some of the infrastructure at the oval, especially the football clubrooms: “The roof leaks, the floor slopes, the changerooms are barely adequate and you cannot see the play from the clubhouse. A NEW two-storey community facility and clubroom building as the central hub of the precinct. It would comprise football, cricket, Lions Club and other community group clubroom facilities, changerooms for all sports, a gymnasium, a bar and possibly a restaurant, a multipurpose community meeting and function spaces, storage space and administration facilities. A REGIONAL tennis hub and state’s umber two venue for tennis. Through a partnership with Tennis SA and Tennis Australia, plans are in place to develop a 14-court facility catering for regional tournaments, casual community use and a home for two tennis clubs. The projected cost of $3.5m includes new tennis clubrooms and pro shop. A HUB for community recreation, sport and events. This includes a walking and running track, a playspace area, picnic facilities, a dog park, BMX track, public amenities and landscaped open space suitable for casual recreation and events. Scheduled sporting facility works include an upgraded oval surface and new turf wicket, redevelopment of one of the three existing bowling greens to cater for all-weather play and refurbishing the existing lawn bowls clubrooms. Broadview Oval playspace and fitness track in Prospect. Picture: Supplied by Prospect Council. “This is our number one priority at the moment because we notice the oval gets more use with kids, particularly for tennis and footy, than any other oval in Prospect,” Mr O’Loughlin said.